This website is a visual database of shipwrecks and underwater obstructions gleaned from NOAA’s extensive archive of multibeam bathymetric data. 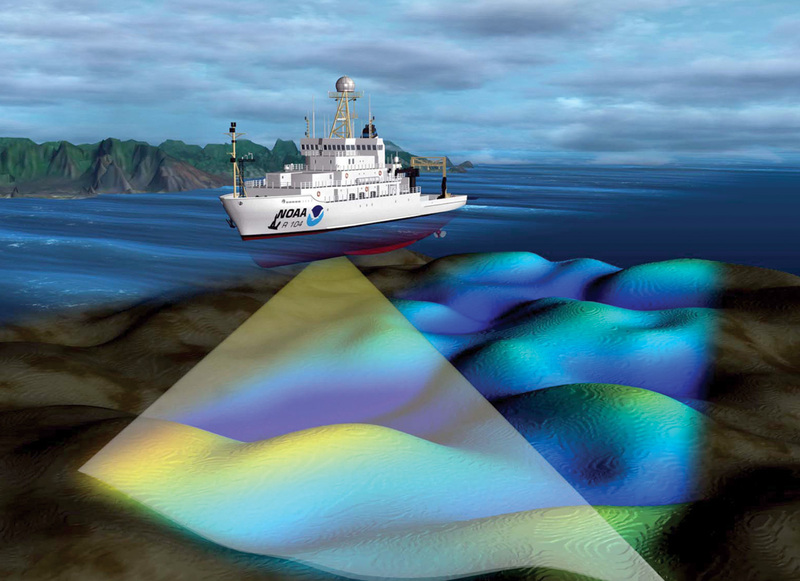 NOAA’s National Geophysical Data Center is the largest public domain multibeam data repository in the world. Hydrographic survey vessels employ multibeam echosounders to collect hi-resolution images of the seafloor. These sonar systems emit a swath of narrow acoustic beams that paint a photorealistic picture of what lies below. The data collected by these systems is used primarily to update nautical charts for the National Ocean Service, but a major benefit is their ability to clearly reveal shipwrecks with near pinpoint location accuracy. It’s not known exactly how many shipwrecks and underwater obstructions exist in the archive, but it’s safe to assume that the number exceeds thousands. I have a list of more than 100 wrecks and obstructions ready and waiting to be added to the database. It’s a slow process so check back often or follow me on Facebook. Multibeam sonar surveys collected by NOAA and other hydrographic agencies are archived at the National Geophysical Data Center (NGDC). The NGDC website makes it easy to search for and download multibeam sonar data. The best part is the data is absolutely free! And be sure to visit the Seafloor Mapping Lab, California State University Monterey Bay. CSUMB has been at the leading edge of multibeam mapping in support of California’s Seafloor Mapping Project. The simplest method for viewing multibeam sonar data on your own is through Google Earth. Many (but not all) multibeam surveys have been incorporated into the Google Earth base map. The Google Earth base map is also an integral part of this website. If you want to download data yourself for viewing there are several Geographic Information Systems (GIS) available that can handle the job. Some are more expensive than others. The more popular GIS applications are Global Mapper, ArcGIS and MB-System. As a maritime historian and shipwreck researcher I utilize multibeam sonar data to locate ship and aircraft wrecks lost at sea. For 18 years I’ve been studying sonar interpretation and using it in my own research. Some of that research has led to a number of significant discoveries. My earliest discovery was one of Southern California’s most elusive shipwrecks: Ex-German Submarine UB88 sunk off the coast of San Pedro in 1921. Subsequent years produced a string of military aircraft discoveries including a Convair B-36 Peacemaker that crashed off San Diego in 1952. In 2013 The Hawaii Undersea Research Laboratory allowed me to participate in their successful hunt for Japanese Submarine I-400 and USS Kailua off the coast of Oahu, HI. In 2016 I had the opportunity to collaborate with the National Oceanic and Atmospheric Administration to successfully locate a Boeing B-29 Superfortress lost in deep water off the coast of Saipan during WWII. The following month saw another NOAA discovery, Japanese cargo ship Amakasu Maru No. 1 sunk off Wake Island in 1942. My work has led to nearly two dozen notable discoveries, all made possible with the aid of multibeam sonar. This website is an outlet for me to share fascinating things that have been recorded on the seafloor. The primary focus is shipwrecks, but I’ve also included aircraft wrecks, artificial reefs and other man-made and natural obstructions. Fishermen and divers should find this information especially useful. I hope you enjoy it. Many of the images you’ll see here have never been published before. Check out my other website too. The UB88 Project.